Birthday is always a very important day for us, especially for children. They are looking forward to that day every year, because they can receive a lot of gifts from families and friends. A surprising birthday party is also necessary. 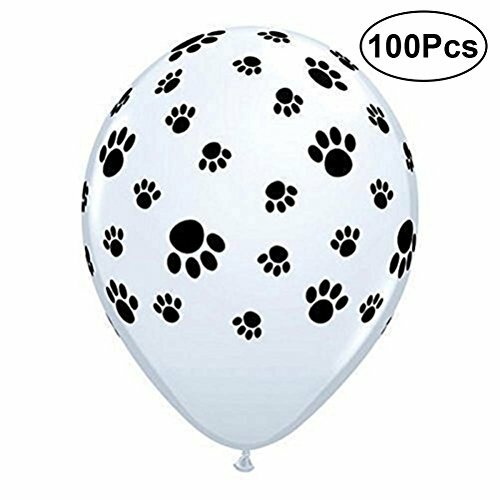 To make the party more attractive, these latex dog paw balloons are nice decorations. Blow them up and make the party more festive and memorable! - Suitable for various or parties decoration, like birthday, wedding, etc. - These rubber balloons are elegant and versatile decor for birthday party. - With dog paw pattern design, make your birthday party more expectantly. - These decorations are reusable, you can store it carefully for next time using. Color: White and black. Material: Latex. Size: Approx. 12inch. These rubber balloons are elegant and versatile decor for birthday party. With dog paw pattern design, make your birthday party more expectantly. These decorations are reusable, you can store it carefully for next time using. Suitable for various or parties decoration, like birthday, wedding, etc.